Combine wine and archaeology on this day trip to Pompeii from Naples or the Amalfi Coast. With an archaeological guide, explore the World Heritage–listed ruins of Pompeii, the ancient city covered in volcanic ash from the eruption of Mt Vesuvius. Then enjoy a lunch of fresh regional products and a wine tasting at a nearby vineyard. After pickup in Naples, Sorrento, Salerno or other select Amalfi Coast location, your day trip starts with the drive to Pompeii, a UNESCO World Heritage site known for its destruction during the eruption of Mt Vesuvius. Take an approximate 2.5-hour tour of the ancient ruins with a knowledgeable guide to see archaeological sites like the forum, basilica, thermal baths, municipal buildings, bakery, brothel, fountain and Jupiter, Apollo and Venere temples. 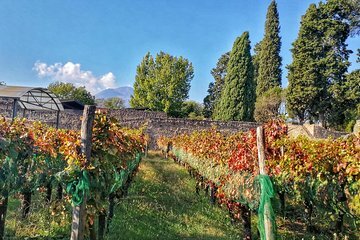 There are a number of vineyards and wineries not far from Pompeii that produce wine such as the celebrated Lacryma Christi (Tears of Christ); you’ll visit one of these popular vineyards, located on the slopes of Vesuvius (Vesuvio), for a buffet lunch and wine tasting. Your day trip then ends with return to your pickup point. Excellent guide, Giorgio. Very knowledgeable, and accommodating for our family group.